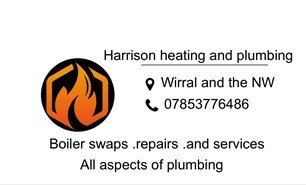 Harrison Heating and Plumbing - Central Heating Engineer based in Wirral, Merseyside. We aim is to provide complete customer satisfaction. We offer guaranteed quality work by professional Gas safe engineers. We specialise heating and plumbing diagnosing, repairing and servicing all gas domestic boilers. If you need a new A rated boiler call us for a free no obligation quote. Do your radiators have hot spots and cold spots if the answer is yes, this could be due to dirty water (Sludge) within the heating system.